Prepare your students for exams and patient encounters with Bates’ Visual Guide to Physical Examination. With 8 new hours of examination videos designed with your students in mind, it’s the ideal physical assessment learning system. Dynamic, clinically oriented, head-to-toe assessment videos. Interactive OSCE-style exercises to prepare students for exams and patient encounters. Access anytime, anywhere on and off campus with this web-based platform. Quick and easy searches and intuitive interface. View on your computer, iPad and smartphone. 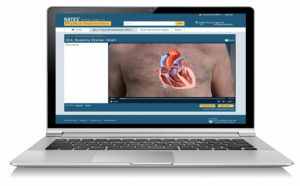 Comprehensive and evidence-based – includes assessment techniques, health history, communication and building the patient-practitioner relationship. Includes patients and examiners with a range of cultural/socio-economic backgrounds to provide students with a solid foundation in examination techniques. The ideal institutional solution to support your students. © 2019 Wolters Kluwer. All Rights Reserved.